LED Troffers come with optional wireless controls. LED Troffers are available in LPEC and LPASC variants with 1 ft x4 ft, 2 ft x 2 ft and 2 ft x 4ft sizes. Units deliver 144 lumens per watt and are offered in 57 standard lumen packages from 2000 to 9000 lumens. Products are integrated with programmable drivers and come in one-piece construction. Troffers are DLC Listed. LSI is excited to bring customers its latest advancements in both its LPEC and LPASC recessed LED luminaire families. At up to a maximum of 144 lumens per watt across the various color temperatures, lumen packages and sizes (1'x4', 2'x2' and 2'x4'), these are among the very best performing troffers on the market today. All are either DLC Listed or DLC Premium and are available with optional wireless controls. LPEC and LPASC troffers are available with a total of 57 standard lumen packages between 2000 - 9000 lumens, and their programmable drivers allow for custom lumen packages anywhere within that range. 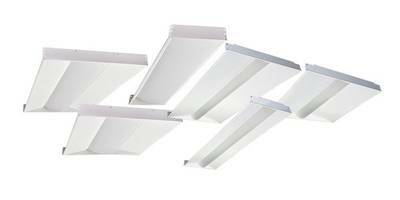 Additionally, the one-piece construction offers bottom fixture access for convenient mounting and maintenance. These fixtures are proudly manufactured in the U.S.A.